By now you would have most likely seen my never ending posts on my breakfasts on Instagram and Facebook and you would probably wonder why. I mean, my breakfasts look simple and nothing great and definitely wasn't taken at some fancy cafe or coffee shop and neither are they Pinterest-material! BUT you may have noticed that in every single picture that I posted, there is a packet of Ducth Lady Purefarm Full Cream Milk or Dutch Lady Purefarm Low Fat High Calcium Milk. Since I was small, I was taught and trained (or rather forced) by my mother to have breakfast, whether I like it or not or whether I am in a hurry, be it a simple glass of milk or malt drink, a slice of bread dipped in chocolate drink, a half-boiled egg or anything for that matter. I still remember finishing my breakfast when the school bus is already waiting outside. The key note is to ALWAYS HAVE BREAKFAST because we all know that breakfast is the most important meal of the day. I really need to thank my mother for instilling this good habit in me because until today I never ever skip breakfast and I ensure that my kids have theirs too. I try to have healthy breakfast like eggs, bread or sandwiches, cereal or oats but of course, being a typical Malaysian, I do indulge in the occasional nasi lemak and roti canai. I always down my breakfast with a cup of coffee and occasionally I used fresh milk to go with my coffee. Now that I am in my *ehem*3 series*ehem* and a mother of two, with one who is currently breastfeeding, I know I have to keep a healthy lifestyle and I have to take care of myself so one way to do it is by drinking milk to get the much needed calcium to strengthen my teeth, bones and hopefully *fingers crossed* I won't suffer from joint pains and osteoporosis! Apparently, Malaysians are not getting enough calcium from their daily food intake. To think of it, some people may not like milk so much but good news, Dutch Lady has a variety of milk flavours to choose from namely chocolate, coffee and strawberry and they come in various sizes too. Nearly one in two children does not have adequate calcium intake*; and the average intake of calcium among adults comes up to less than half of our daily requirement**. The nutritional gap may lead to a brittle nation. 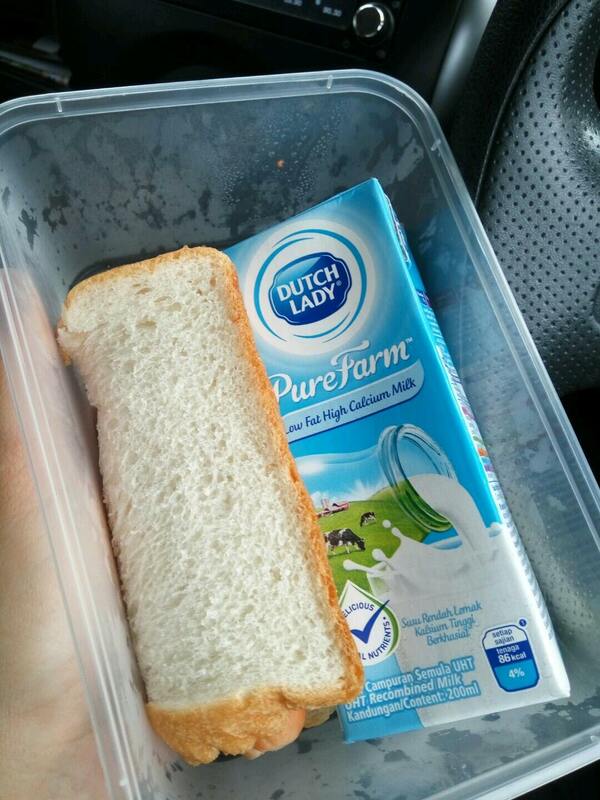 Hence, Dutch Lady Malaysia encourages Malaysian families to load up on milk before work or school. Just two servings a day helps meet a family’s nutritional requirements! Having one of the two servings at breakfast pumps at least 200mg of calcium into the body. 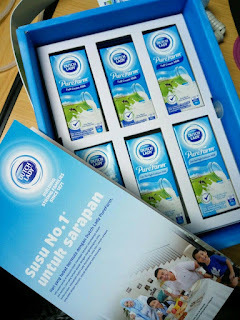 I recently received a box of Dutch Lady Purefarm Milk which contains 7 packets of milk. 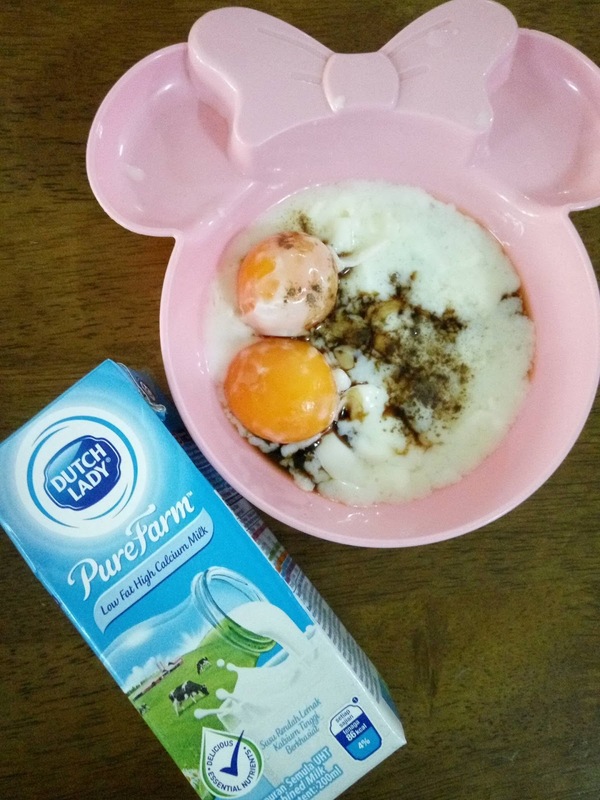 Here I want to share with you how I have my breakfast paired with Dutch Lady Milk. Of course you can go crazy and get creative with your breakfast. DAY 1: Breakfast of sausages, toast, two sunny side ups and sauteed mushrooms, courtesy of Dutch Lady. What a pleasant surprise I received upon returning from Court on Monday, 19 September 2016. DAY 2: I had to rush to Court in Shah Alam on Tuesday, 20 September 2016 but that doesn't mean I have to skip the most important meal of the day! 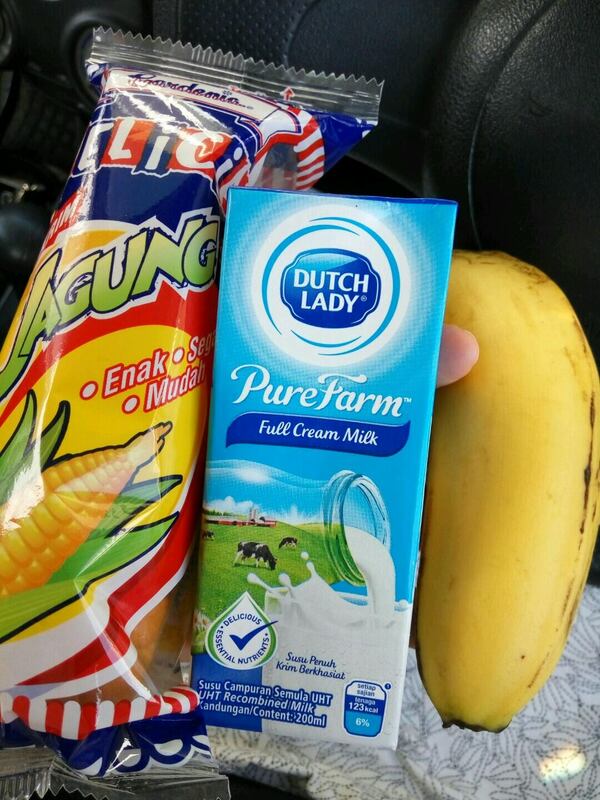 So I simply grabbed a banana, a roti krim and a packet of Dutch Lady Purefarm Full Cream Milk. 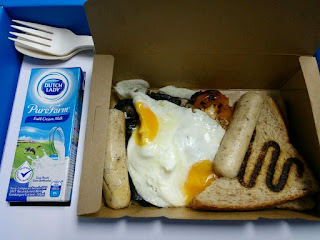 I had my breakfast-on-the-go and it was a great combination of breakfast and I was off to a good day in Court. FYI. waiting in Court may take ages so with a full tummy, I don't have to starve while waiting for my case to be called. 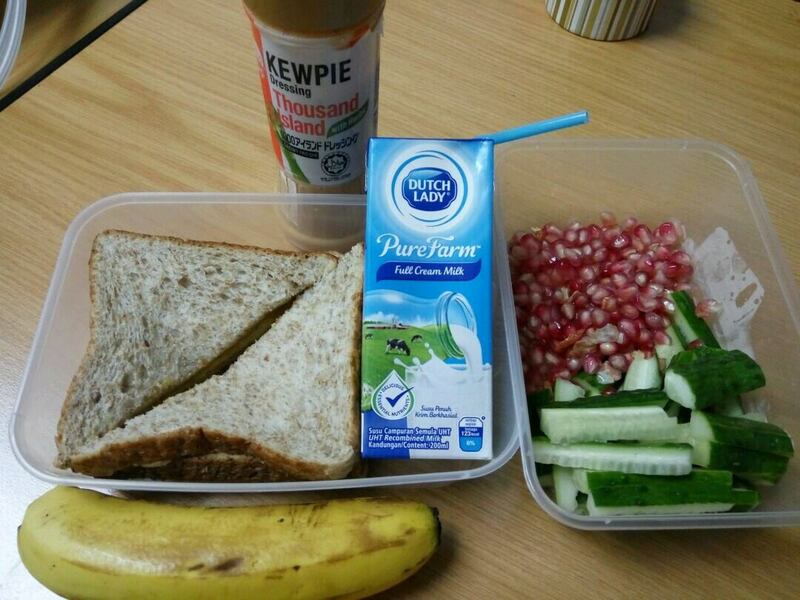 DAY 3: A simple bread with butter and kaya, a banana, some pomegranates, japanese cucumber and of course, my favourite milk. DAY 4: Clearly I have a lot of bananas at home so I have been having bananas everyday of the week. For breakfast day 4 I had bread with Reese's Chocolate Peanut Spread with bananas and chia seeds, paired with Dutch Lady Purefarm Low Fat High Calcium Milk. DAY 5: Again, I have to attend Court so I had a quick breakfast of bread and sausage and none other than Dutch Lady Purefarm Low Fat High Calcium Milk. DAY 6: Finally the weekend is here which means I can sleep in a little until my Babycakes and Babypie woke me up and bugged me, that is! We were going out so we had a quick breakfast at home. 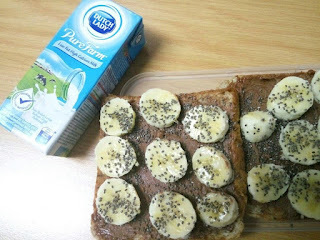 Even though it's a quick breakfast, it is nutritious and fulfilling. 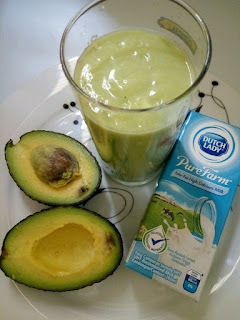 I simply blended some avocados with Dutch Lady Purefarm Low Fat High Calcium Milk and some honey for sweetness. This thick smoothie is packed with nutrition, omega 3 and goodness from the milk. DAY 7: What's breakfast without a serving of good ol' half-boiled eggs, right? But in my case, they're more like 3/4 boiled eggs because the yolks have hardened. Did you know that after about eight to 12 hours from your last meal, a glass of milk provides the nourishment your body needs in the morning to regulate itself? So guys, if you are really really pressed for time to have breakfast because you need to catch the LRT or the morning bus or you have to be in a meeting or court by 9am, at least just grab a packet of milk to start your day on the right track. * Nutritional status and dietary intakes of children aged 6 months to 12 years: findings of the Nutrition Survey of Malaysian Children (SEANUTS Malaysia), British Journal of Nutrition (2013), 110, S21–S35. ** Current nutrient intake among Malaysia, Adult: Finding from MANS 2014, THE MEDICAL JOURNAL OF MALAYSIA, VOL. 70 SUPPLEMENT 1 SEPTEMBER 2015, pp 12. *** Based on Retail Audit for 12 months ending July 2016 in Total Penisular Malaysia (Copyright © 2016, The Nielsen Company (M) Sdn Bhd). memang kena minum susu la kan.. densiti tulang makin hari makin menyusut.. risau osteoporosis jek.. hee~ 40% wanita yang berusia 30 tahun keatas menghidap maslaah osteoporosis tau.. jadi.. minum lah susu.. sebba.. skearang ni ade jugak awal 20-an masalah reput tulang.. Same to u! Nasib baik I tak lactose intolerant. Kesian jugak pada yang tak boleh ambik dairy.